You can't buy a Transit Connect yet, but it's not stopping Ford from customizing it every which way, including one for the New York Auto Show. 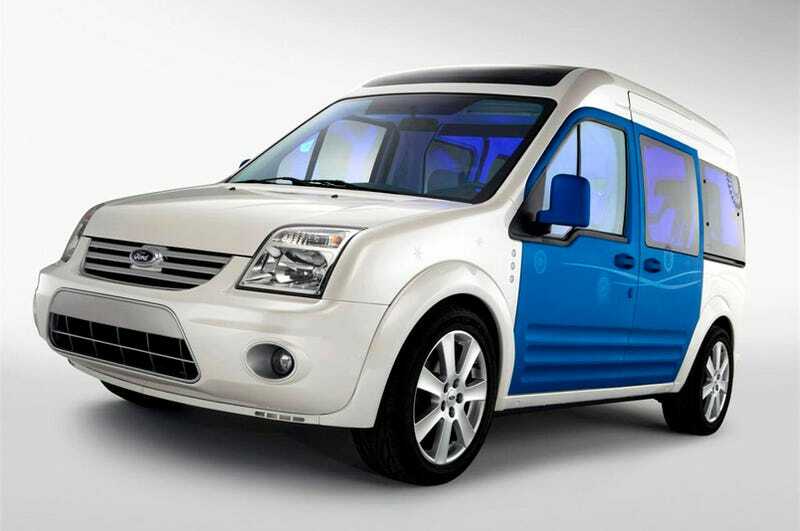 It's called the Ford Transit Connect Family One Concept. Ford has shown a lot of Transit Connect concepts in the past, but this is the first eschewing the commercial side for the consumer market. As the name implies, the Transit Connect Family One Concept is aimed squarely at families. According to Ford's design team, its meant for "the coolest mom," whatever that means. What we do know is, as you'd expect, most of the features are aimed at kids. The rear seats have a kid-friendly entertainment system, door sills you can scribble on (explain that when junior writes all over Grandpa's S-Class) and removable seat covers to make it easier to wash off the never-ending stream of filth kids seem to generate. There's also integrated dispensers for hand sanitizer and sun screen, a set of walkie-talkies with charging station, an awning over the rear cargo doors — which have scooters built into them — and stroller storage under the floor. But not everything is meant for the kids. Included in the concept is the Ford Work Solutions package (though re-dubbed "Family Works" in this application) which allows RFID tagging and sensing in the car. So, if "the coolest mom" is in a rush, she doesn't have to rifle through the junk in the back, she can ask the on-board computer and it scans the area, finds the diaper bag, stroller, Timmy's Game Boy and whatever else you've tagged and decided you need to bring along (the kids themselves, perhaps). It also gets the first non-Fusion Hybrid application of the SmartGauge system, even though it is not itself a hybrid, hey you can still drive efficiently without hybridization. There's also the neat blue neon lights and overhead sunlight. That's stuff mom's like, right? Expect to see the long-named Ford Transit Connect Family One Concept debut on the stands of the New York Auto Show. ANN ARBOR, Mich., April 3, 2009 – Ford is listening to the unique wants and needs of families and responds with the Transit Connect Family One concept – a space that's all about helping parents and engaging children. "Transit Connect is a versatile vehicle that can be adapted to a wide variety of applications," said Mark Fields, Ford's president of The Americas. "The Family One concept delivers fun with function. This fun, cool space is for parents and small children alike, combining fuel efficiency with advanced technologies that can help keep families connected on the go." Designed for "the coolest mom"
The Family One concept is based on the Transit Connect, a global Ford platform adaptable to a wide variety of applications, both personal and professional. This concept vehicle represents Ford's first effort in showcasing the versatile Transit Connect for personal use. "The customers we envisioned when developing the Family One are cosmopolitan parents in their mid-30s with highly refined design sensitivities," said Ford Designer Chiwei Lee. "They waited until they were ready for children and see parenthood as adding to their aesthetic portfolio, instead of smashing it." Transit Connect has a utilitarian form that offers 135 cubic feet of space on a compact platform, with agile driving dynamics ideally suited to urban driving and tight spaces. The vibrant color scheme and expansive greenhouse area combine to give the Family One concept friendly visual character and a bright, airy interior space. "For children, the conceptual intent of the vehicle is to be as engaging and entertaining when parked as it is on the go," added Lee. "The Family One easily transitions from functional family mobility to ‘base camp' when the coolest mom puts the shift lever into the park position." The second-row seats in the concept provide youth passengers with ample room to get comfortable, enjoy projected digital media entertainment on the bulkhead-mounted sunshade screens or look through the expansive windows. Side rear inner door panels are water-pen friendly and easily wipe clean for the next round of creative inspiration. Clever, family-friendly features include built-in hand sanitizer and sunscreen dispensers, family walkie-talkie radios that charge when docked, an integrated first-aid kit and cargo door-mounted folding twin scooters. The storage area beneath the rear floor holds a folding stroller and an integrated awning extends from the open rear cargo doors. Seat covers are removable, washable and can be changed to redecorate and evolve with changing preferences. The Transit Connect Family One concept vehicle uses in-dash computer technology to keep a family organized, on-schedule and properly equipped with everything from diaper bags to sporting goods, back packs and homework folders that populate the active family environment. The Family One concept employs radio frequency identification (RFID) technology to keep track of all the items the active family needs to stay organized. When the driver enters the vehicle with children, the in-dash computer will provide notification that Timmy's hockey equipment is still in the front hall closet. Using predictive algorithms to "learn" based on past usage, the system will identify missing musical instruments or homework on the way to school and will remind parents if they haven't packed clubs for a scheduled Saturday golf outing. The system is designed to be intuitively easy to operate, with minimal menu scrolling and programming. It also plays a role in safety – adding to peace of mind – as the system integrates with sensors to notify the driver if a child seat is improperly attached or tensioned. The technology is designed to seamlessly integrate with the parents' digital lifestyle. The Family One concept is powered by a 2.0-liter I-4 engine with four-speed overdrive automatic transmission – delivering 22 city and 25 highway miles per gallon – and features SmartGauge™ to help parents drive more efficiently. Looking forward, the global Transit Connect platform has capability to host any one of several efficient engine alternatives, including EcoBoost™ power and battery electric propulsion. Ann Arbor, mich., April 3, 2009 – The Ford Transit Connect Family One concept vehicle combines high-technology features to keep children and parents organized and entertained with simple, clever touches that make family outings more fun. "The Transit Connect Family One concept showcases futuristic technologies that can help keep busy, active families in the right place, at the right time, with the right stuff," said Andrew Georgescu, product marketing manager. "Parents will appreciate Family One for helping them manage their busy lifestyles, while children consider the vehicle a place of their own." In a single day, the Family One can help busy parents by confirming that Timmy's backpack and homework folder are on board, provide assurance that Josh's child safety seat is properly installed and that the whole family can have a base camp – with shade – during soccer practice. Family One also can provide turn-by-turn directions to a new organic grocery store, coach drivers to maximize fuel economy and entertain a second-row passenger with cartoons while another passenger converts fractions to decimals in a Web-based homework application. The Transit Connect Family One concept employs an innovative in-dash computer with radio frequency identification (RFID) technology designed to keep an active children and parents organized, on schedule and properly equipped. The concept vehicle uses Ford Work Solutions™ technology as a foundation for family applications for the not-too-distant future. Ford Work Solutions is an available collection of technologies and industry-first features that provide customers connectivity, flexibility and security to better run key aspects of their business – or their lives – from their Ford vehicle. It will be available in key Ford vehicles, starting this summer. The concept's forward-looking Family Works application uses predictive algorithms, based on learning from past usage, to remind parents of scheduled events and the equipment required for them. If the system is aware of a regularly scheduled band practice, for instance, it will simplify the process by notifying the driver if the needed musical instrument is not on board. RFID tags can be affixed to any number of items such as backpacks, homework folders or sports equipment so time and fuel can be saved by avoiding unnecessary trips for forgotten items. The system synchronizes with a smart phone to integrate with the parents' digital lifestyle to help with hands-free calling, schedules, reminders and to-do lists, helping parents to be smarter and better prepared. Safety and peace-of-mind for parents are enhanced, as the system wirelessly communicates with sensors in the child seat, assuring the driver that the unit is secured and the attaching tether is tensioned properly. According to the 2005 LATCH study, published by the National Highway Traffic Safety Administration (NHTSA), almost 40 percent of child seats are improperly attached. Family One features intuitively-operated navigation, which easily helps get families where they need to go. The SmartGauge™ instrument cluster even will tell the driver how economically the vehicle is being driven, with an easily understood graphic interface. Entertained and engaged young passengers are happy passengers, making life easier for parents. Second-row passengers in the Transit Connect Family One concept look up to see a transparent sunshade mounted on the bulkhead behind the driver's area. The sunshade transforms to become a digital infotainment center featuring a pair of projected floating screens with high-resolution imaging and exceptional color contrast. The screens can display digital media entertainment, three-dimensional gaming, interactive educational opportunities and wireless Web connectivity.